Pre-Construction: ***To-Be-Built 1150 square feet under air, New Construction BLOCK home*** List price INCLUDES this lot, but you can choose any lot of your choice to build on! Financing available. INVESTOR ALERT: Great for spec homes or rental inventory homes! Resale as a retail spec home when finished: move in ready! Or keep as a rental property. OR sell your old rental inventory homes and replace with this new block construction, upgrade your rental inventory! Finally a quality built new home for an affordable price! This 3 bed, 2 bath features open kitchen with island, master suite with walk in closet and vaulted ceilings. Available options to upgrade for a reasonable up-charge include: two car garage, lanai and granite kitchen counters. This Custom Home Builder has been building custom quality projects including neighborhood development and single family homes for over 20 years. Honest, friendly and reliable service! Ask your agent for the attached floor plan and spec sheet. 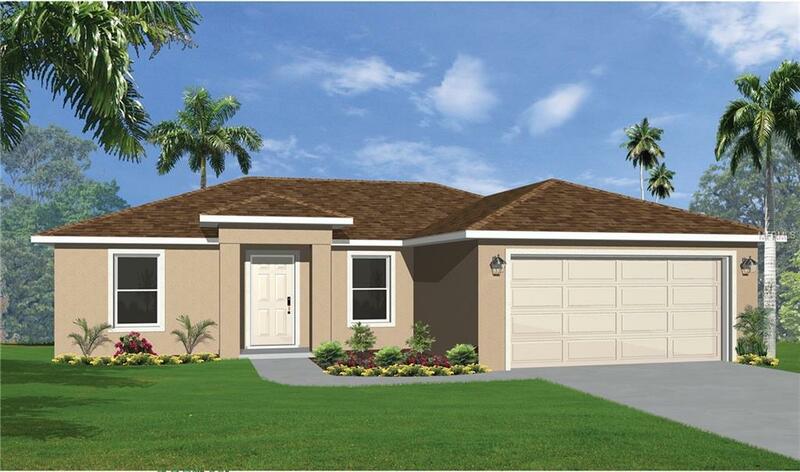 Visit our model (opening in March 2019) on Weatherton St in North Port for all available floor plans. Features and upgrades shown in the renderings, graphics and floor plans are approximate and are for illustrative purposes only. This builder has other floor plans available: 1150 sqft, 1419 sqft, 1865 sqft, 1950 sqft, 2043 sqft. Listing provided courtesy of Anytime Realty Llc.